Release Date: October 11th, 2006 (Village East Theater) by Balcony Releasing. Directed by Steven Ascher and Jeanne Jordan. BASIC PREMISE: A documentary about Stephen Heywood, a 29-year-old husband and father diagnosed with ALS, whose brother, Jamie, searches for a cure. ENTERTAINMENT VALUE: Many people have been diagnosed with ALS, also known as Lou Gehrig’s disease, a genetic disorder which leads to atrophy and paralysis. 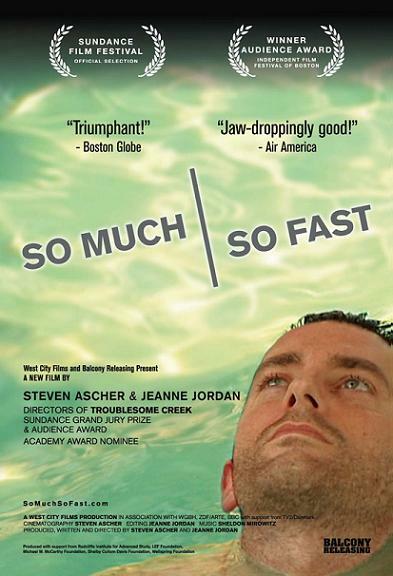 So Much So Fast follows Stephen Heywood as his physical condition gradually deteriorates while he struggles to lead a somewhat normal life—spending time with his young daughter and wife, Peggy, as well as playing interactive video games on the computer. Peggy takes care of his basic needs—feeding him, washing him, etc…— and, when his speech becomes incoherent, he communicates through a computer. One of his friends constructs an object that would help him move the mouse more easily. It would have been interesting to explore how Stephen adjusts to all the new devices and to others changes in his lifestyle. Luckily, his brother, Jamie, goes on a quest to cure ALS by forming a not-for-profit organization which searches for a cure for ALS, primarily by testing and experimenting with the cures for similar diseases. Directors Steven Ascher and Jeanne Jordan do a great job of including personal, informative interviews with Peggy and Stephen which help to humanize them. Some surprisingly humorous, witty scenes feel quite refreshing and enliven this thoroughly fascinating film. SPIRITUAL VALUE: Watching So Much So Fast will inspire you to count every single one of the blessings that life offers you. Stephen Heywood is surrounded by hope and plenty people who love and care about him unconditionally—particularly his wife who truly lives up to her vow of loving him “through thick and thin”. IN A NUTSHELL: Lively, fascinating and inspirational.